The tendency of molecules of a solvent to pass through a semi-permeable membrane from a less concentrated solution into a more concentrated one is known as osmosis. This is a basic science experiment that introduces kids to the concept of osmosis and reinforces their learning of the subject. 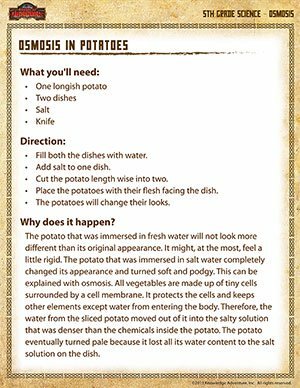 The science experiment requires minimum intervention of adults and 5th graders can safely carry it out on their own, except slicing the potato with a knife. Do check out other such exciting science experiments for kids too!